New Economics for a World in Revolution? Is the World in the middle of a new Revolution? 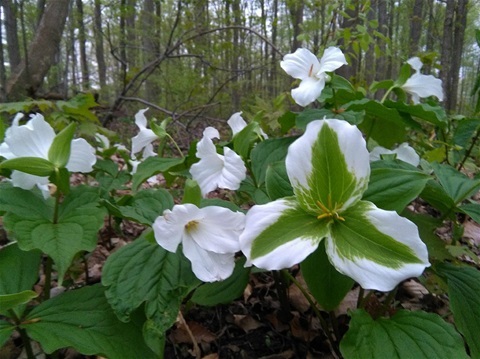 Does the image of the Triskelion Trillium, with its green-highlighted petals suggest a time of transformation for us all? It might just be the case, despite the repeated horror-shows that we see in the news events of our modern times. This World in Revolution theme suddenly struck me a not only possible, but perhaps necessary for the survival of the species. There has been an almost aimless drift into chaos and cruelty that seems to characterize much of what we see now. But under the surface, there are events that are different, and perhaps it is the "hidden dragon" that will define the future, not the fighting wildcats of arrogance and ignorance that we see refected daily in our current-event feeds. 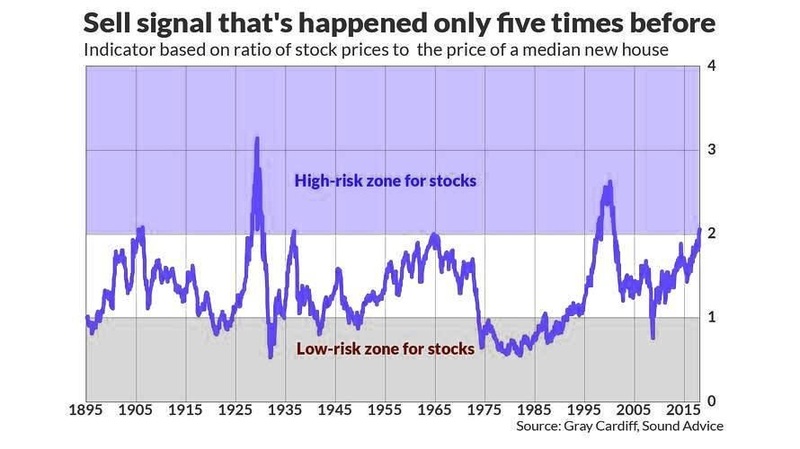 Mark Hulbert highlighted Gray Cardiff's interesting chart from Mr. Cardiff's "Sound Advice" letter,which suggests that equity market values are stretched. The idea is that real-estate and stocks compete for capital, and that currently, the stock market is over-valued, compared to house values in the USA. This seems to be what my numbers are suggesting also, given the low DJIA dividend rates. But perhaps we should be looking at equity earnings yield, versus commercial "cap-rates", or the effective yield on commercial real-estate assets. The other problem with this chart, is that asset "overvaluation" may well have much further to go. My models that make money, are the ones that "go with" the trend, not the ones that bet against the trend, and look for "mean reversion". This is a key chart now, here in August-September of 2018. The little blip up a the end (where rates have moved from arould 1.5% to close to 3%) does not look like much. But one needs to realize this is a *doubling* of interest costs for the issuer - the US Gov't. Back a few years ago, that nation's debt was only a few trillion dollars. But here in 2018, that number is up to over 16 (close to 17 *trillion*, by some estimates), and growing rapidly. The USA issues dollars which are the world's reserve currency. That is like issuing cheques to people who don't cash them - it is a fine, great place to be. But once you have reached the top of the mountain, all new directions lead down. The rules of economics have not vanished. If rates don't rise soon, there may well be a non-linear jump to high-inflation. If rates do rise - even a little bit - financing costs will gap upwards rapidly in this very indebted entity - which will have to either print money to cover the debt, or seriously cut expenditures. The increase in interest rates in 1929 - from 4% to 6% - sparked the margin calls that forced over-leveraged folks to sell. The process was non-linear, and the market reacted in a non-linear manner. The Great Depression was a result of the money-starvation. Central Banks flooded the world with funds to prevent that scenario happening in the 2007-2008 Great Recession (provoked by the collapse of a runaway asset-bubble in US house prices). But here in 2018, the world is awash with money, and the Gov't entities are highly leveraged. Many analysts are calling for a market crash, but we may find that interest rates and asset values track up together for the next few years. The reason? See next chart, of M1 for USA. This chart also suggests that the good numbers we are seeing in the US economy now (< 4% unemployment, > 4% annual GDP growth), which seem to suggest stability and successful economic strategy, might really be mostly due to this "pedal-to-the-metal" flood of fiat-money creation. 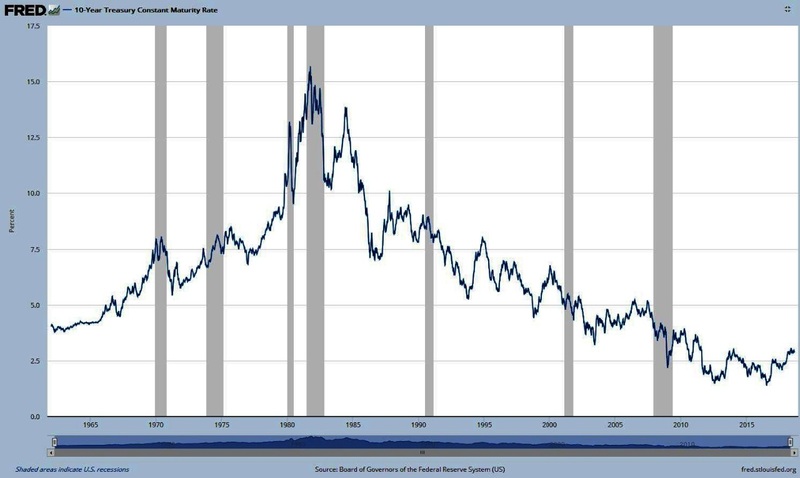 It is not really possible to have very much of a "bear market" in US-based assets, with this sort of money-creation happening. The various analysts calling for a bear market are forgetting about this tsunami of cash. Here is the DJIA - Dow-Jones Industrial Average, over the same range, January 1974, to Aug. 24, 2018. Note that the liftoff in stock prices pretty much matches exactly the great thundering flood of cash generated by the US Central Bank authorities. Remember, correlation does not imply causation. And we are not saying it does. But we are asserting that asset valuations are driven by cash-available. 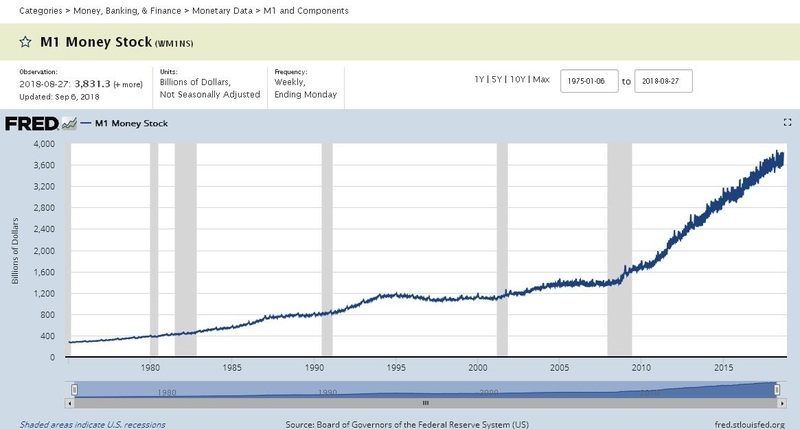 As long as the US money supply is growing rapidly, most assets will probably continue to rise in price, given that business profit levels remain reasonable. Although stock market valuations are stretched, I am actually quite positive and constructive on the future. The world is changing, and some wise and clever stuff is getting done. Look at the EV sales numbers in the US (in above chart, from this URL: https://insideevs.com/monthly-plug-in-sales-scorecard/. Look at the July 2018 sales number (almost 30,000 vehicles), versus July, 2011, when it was less than 3000. Thats a 10-fold sales growth. As Sherlock would say, "The Game's afoot!" Now the sales are not all Tesla's, but that is not the point. The key point here, is that a truly revolutionary change in modern world transport infrastructure is underway. Invest in this stuff, at these prices, and you *must* have capital appreciation, or the investment process does not work well, in that it is not doing much better than inflation. 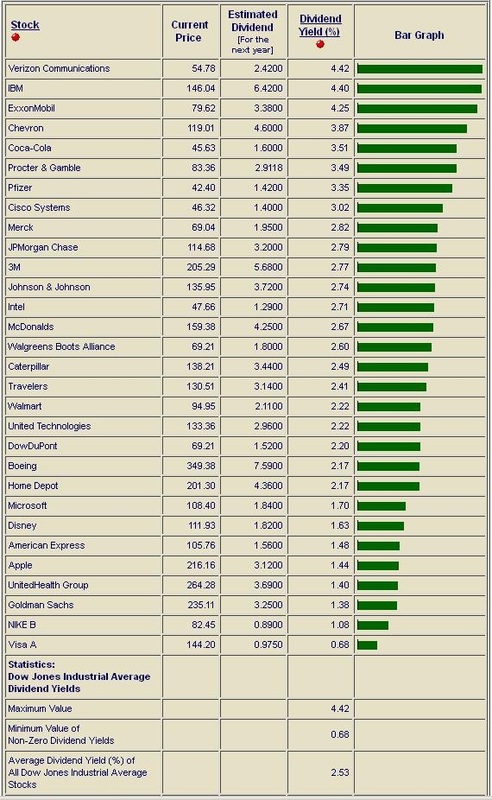 The average dividend yield of DJIA stocks is 2.53%, according to the "indexarb.com" website data I have reproduced here. That is *below* the zero-risk yield on the US 10-year Treasury bond, which is around 2.85%, moving to over 3% pretty soon (according to Federal Reserve comments.) 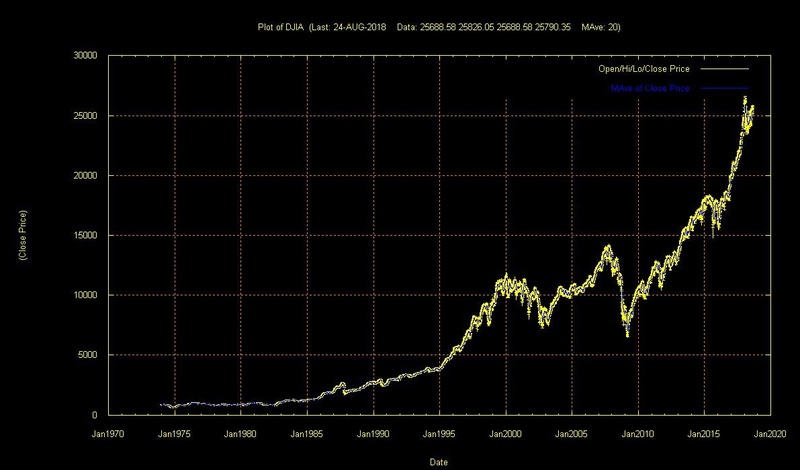 This means you are maybe being unwise if you buy DJIA stocks, because you are taking on *more* risk, for *less* return. And that is just a bad trade. As an independent owner/operator trader, you can just walk away, and tend your garden. You need the stock price to rise, for stocks to make investment sense, at these yields. This capital appreciation might happen, because it tends to mostly always happen. And with the world's Central Banks creating money, this process can continue. But if (when?) the Central Banks take their foot off the M1 gas-pedal, you might get the same response as if you lift your foot off the pedal of your fancy rear-engined sports car, traversing a curve. (Hint: you will track a tangent to the curve, right toward the ditch (or wall or rock-face), as the car's tires break traction from the road-surface..). This is why market corrections happen. A market-correction is the response that occurs, when valuations get stretched beyond reason, because of monetary conditions that are called "accommodative". This just means they are fire-hosing money at the economy to deal with some problem the government created. Look at history. 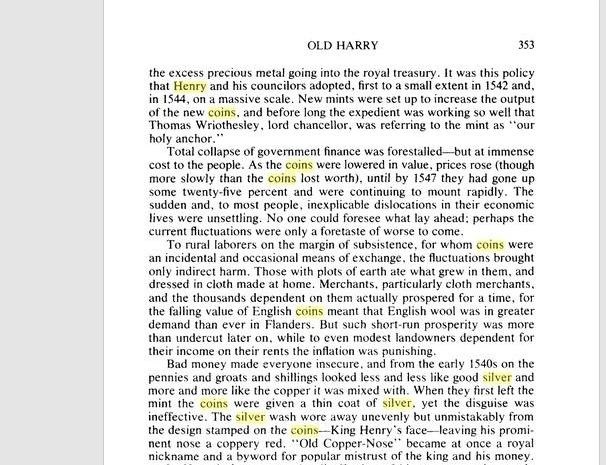 This *always* happens - from the "Bellum Nummarius" (the Roman "Money War", when some Senators were caught minting their own private runs of silver coins at the mint at Cyzicus), to the royal coin-debasers of the Middle Ages, to Tudor England (Henry VIII and his silver-washed debased coins - see image below), to the US Confederacy, to almost every single country in South America and Africa, and to Germany in the 1920's Weimar Republic. Almost every nation has hacked their own money supply worse than Bitcoin or Etherium ever can or will ever be able to enable, with serious and problematic consequences. And this money-problem is part of the revolution I am talking about. In order to get secure, honest, "un-hackable" money, we may have to change the nature of money radically, since returning to using gold disks is probably not an option. But we need to fix this hacked-money problem, since the governments with their fiat currencies are a major source of economic destabalization and failure, as history has shown down thru the centuries. Perhaps we are on the threshold of a solution? We need some form of honest, non-hackable, real money - which is provably free from government debasement and degradation - either at the internal circulating supply level, or at the external, exchange-rate level. One of my real concerns, as an economist, is that the US markets may *not* re-price domestic asset financial markets, and instead, re-price the US-dollar external exchange rate. This would seriously stimulate the US economy, but would have the effect of destabilizing the rest of the world - especially Asia and Africa, which basically operate using US dollars. And if the value of the US-dollar falls too quickly, it will damage many foreign export-oriented firms, and cause serious economic problems for many marginally profitable, Third-World enterprises that are export-oriented. And a wave of business failures could break supply chains, and could provoke a serious global recession. It would be better if the US got their money supply under control, and avoided an "economic war" with their trading partners. If something has to give, better it be the US stock market falling 30%, than the value of the US-$ falling 30%. History suggests one or the other is becoming more likely each day, as the US money supply expansion continues. Here is a reference to an example of Government money hacking, from history. It's an interesting reference to the coin-debasement exercises of Henry VIII of England, the great Tudor King who set England free from the cruel dominance of the corrupt Catholic Church. And how did he fund his operations? By creating degraded money and through confiscation, as governments have always done. This is a page from Carolly Erickson's book "Old Harry", courtesy of Google's mass-digitization efforts. And here is BTC chart. Compare it to the US M1 chart. What is the key difference? The BTC valuation is self-stabilizing, and the total supply is limited by design. The boom/bust 2017-2018 pricing is not too much different from the price of Bank of England stock in the early 1700's. Is BTC the answer to our out-of-control fiat money problem? I am not sure. But it's market-driven mechanism does ensure a degree of self-stabilization, which is clearly absent now from Central Banks in Japan, Europe and USA. This fact alone makes it interesting - and possibly revolutionary. 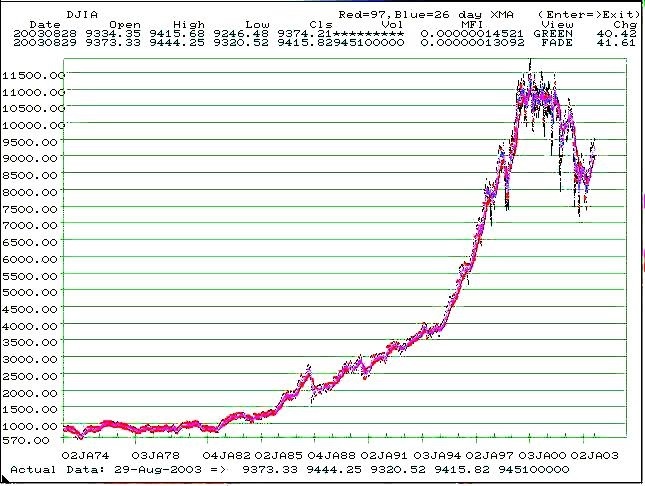 And just for comparison, here is the DJIA - the USA Dow-Jones Industrial Average - showing the index value, on a linear scale, from 1974 to August 29, 2003. 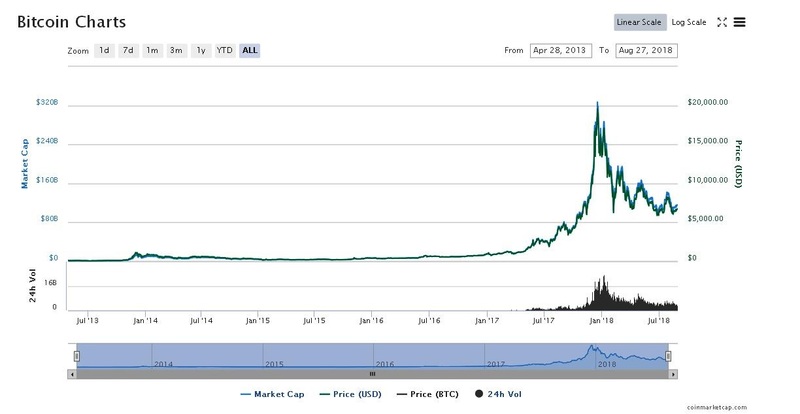 Does this chart not look rather similar to the BTC chart from 2015 until Aug. 27, 2018? Is not the same asset-valuation process at work on both charts? Think about the consequences of this. For most investors, one's "stock portfolio" is a completely virtual, digital good, with little that grounds it in physical reality. And the folks who run companies, can issue an *unlimited* number of shares, with absolutely "no par value" (go read a prospectus, if you doubt this assertion.) BTC is limited to a maximum of 21 million virtual "coins". Which process is likely to be a more prudent and trustable repository of capital - the USA stock exchanges (with their legacy of people like Ivan Boesky and Bernie Madoff, and debacles like Lehman Bros., Salomon Bros., General Motors, and so many other corrupt failures), or the hard digital truth of the shared data-repository from the BTC block-chain? Who is - operationally - likely to be more trustworthy, in a corrupt world of "fake news" and dishonest governments? We accept one process - which is configured to be open ended, where digital-only certificates can be issued which are legally defined to have *no par value* whatsever, and where an unlimited number of these digital certificates can be created and sold by the participating commercial entities, whenever they find it useful to do so. And we are critical of the other process, which appears both on the surface, and deeper down, in the operational details, to have a much more fundamentally trustable digital architecture. I remain suspicious of both sets of digital products. But the BTC looks like it might have the edge. The problem, of course, is that it is just *money* - it does not offer a return on the investment. Perhaps that might change. Perhaps the real value for the block-chain "coins", will come when folks use them to set up an off-shore equity exchange, or bond market, which can operate with more fairness, transparency and at lower cost, than is the case with the NYSE, Nasdaq and the opaque global bond market.